For the first time, we have turned north. Our path took us to the town of Vicksburg, which was a huge civil war battle site and is now home to half a dozen casinos and one huge riverboat. What a gorgeous town! Everywhere you look there's a mansion or a statue or a mural or a cannon or ironwork decorations or cobblestone streets. We spent 3 days there and I plan to spend a whole lot more time in the Fall. The mansion tours just about did RRR in: she had said, just the day before, that she should be walking more. Be careful what you ask for!!! And, for some odd reason, people in the 1800s really liked stairs..... a lot! It must have been so they could make grand entrances in their hoop skirts. RRR was not thrilled with the mansions - she felt they needed a good cleaning. The first one was a "town house" and was actually quite small (and a bit dingy) although it did feature a hand-crafted carpet done in petit-point (check out the photo). The second one - Cedar Grove - was gorgeous. 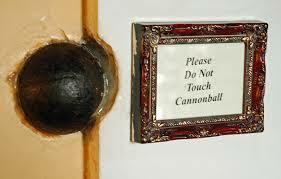 It also featured a canonball from the civil war, which was lodged in the wall. The colours were amazing - one room was done all in Wedgwood Blue, another was dusty rose, another was forest green. There was even a pink Lalicque chandelier and a piano that was valued at $1.5 million. Even more impressive was a huge safe that sat in the formal dining room: it looks just like a buffet table, but was actually a 3000 pound safe that the owner used to hide his valuables when the Union army commandeered the house as a hospital. No one ever guessed that the side table hid all of his money. I was so busy kicking it (they said we could), that I forgot to take a photo. One interesting thing I learned about was the paintings which you see everywhere: they are usually of little kids in very uncomfortable looking clothes that no parent in his/her right mind would ever dress them in. It turns out that, because of the bad winters, painters would paint a selection of bodies in various costumes and with various backgrounds. Then, in good weather, they would travel to wealthy homes and people would pick out their favorite outfit and the background and the painter would just paint in their faces and hands. This led to some weird combos: in this case, there is a painting of a little girl but the face and hands are those of a much older woman. It's kinda creepy. Also creepy was the doll museum..... it's kind of unnerving to have all these little eyes staring at you everywhere you turn. My favorite was the X-files Barbie and Ken. I had to have that picture. And just across the street was the Coca-Cola museum where I spotted a Jabba the Hutt lunchbox. What little kid wouldn't like to bring that to school!? All in all, Vicksburg is a memorable place. I really need to spend some time there to indulge my interests in the civil war era. The place just drips with history!! !